Travel to the farthest reaches of the earth to meet some of the most beautiful women in the world. Click here to play! Befriend beauties from the Orient in this online slot for a chance to uncover untold amounts of treasure. These reels are teeming with beautiful women, each holding a top payout if you can line up three to five of their symbol across an active payline. For example, three to five Japanese women will bring in a top payout worth up to 800 times your line bet. Three to five Indian women will bring in up to 500 times your line bet. Besides beautiful women, there are a couple of special symbols in this game. The first is the Jewels of the Orient logo. This symbol will not only payout a maximum of 2500 times your line bet, but it will also substitute for most other symbols to help you create more wins. The palace is a scatter that will multiply your total bet as well as trigger a bonus round. 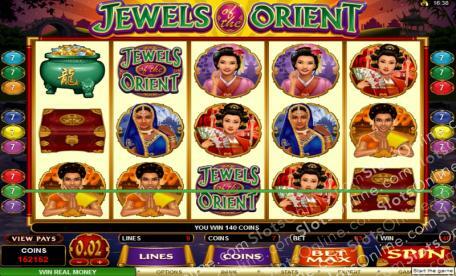 There is plenty to be won while you’re searching for the Jewels of the Orient in this fantastically beautiful online video slot. The palace is a scatter. Spin three or more of this symbol to not only multiply your total bet, but to also trigger up to 40 free spins in which wins can be multiplied up to 120 times. The Jewels of the Orient symbol is a subtitute. It will replace most others, excluding scatters, to help you create more wins. It will also payout up to 2500 times your line bet if you spin five of them across an active payline.